Hello! Thank you for visiting my blog. I'm Jennifer Hays. I live in Albuquerque, New Mexico with my wonderful, brilliant husband, the Bear, and our delightful, rambunctious children, the Little Bear (12) and the Girl Bear (9). 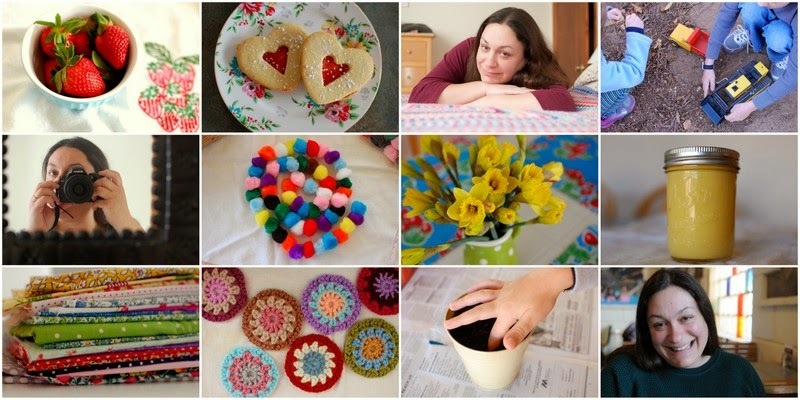 Thistlebear is a place where I write about my hobbies, my family and our simple life at home. I strive for a homegrown, handmade life. I crochet, sew, cook and bake. I love to read. I laugh a lot. I am pretty sure I couldn't live without my Breville electric kettle. I'm learning high-desert gardening as I go; it's been a mixed bag but I keep trying. I'm keeping chickens now, which I never thought I'd do, and I adore it. I write often and I take pictures almost every day. Some of my favorite things are strawberries, tea, crocheted afghans and patchwork. I love to explore my local area, especially now that our children are getting older. We are part-time homeschoolers, which is both rewarding and challenging. We spend lots of time together and our home is (mostly) a very happy one. I have been blogging since 2012 and have found much satisfaction and personal growth through writing, photography and connections with like-minded bloggers and other creative people. I blog to create a written and pictorial record of my family's life. I blog because I love to share. That being said, I tend to share the best of us, the happy and productive moments, and I try to be positive and upbeat. I believe that life is what you make it and I'm proud of the home we've created together. I'm glad you landed here and I hope you'll stay for tea and conversation. My husband and I have an audio podcast called Thistle and the Bear. We discuss topics of interest to us, and maybe to you as well. We are currently on hiatus, but you can listen to old episodes here. You can also find me on Pinterest and Ravelry. I'm a proud member of The Color Collaborative, a group of bloggers who write on a color-related theme each month. You can read my contributions, and theirs, here. In 2015, I conducted a personal challenge called Martha & Me, where I tried a new recipe or craft idea from each issue of Martha Stewart Living magazine. You can read my Martha & Me posts here. I am proud to host a monthly blog link-up, running from fall to spring, called the Winter Project Link Party. This is a link-up for bloggers to share long-term craft projects and encourage each other in their work. You can find more information about the Winter Project Link Party here. I was chosen by Stitch Craft Create to review a crochet how-to guide, Hooked! : 40 Whimsical Crochet Motifs from Weird to Wonderful. My design for a crocheted decoration with strawberry motifs from the book was featured on Stitch Craft Create's website and social media in February 2015. Thistlebear was featured in Albuquerque the Magazine's June 2015 Home and Garden issue. My Sugar and Spice crocheted cardigan was featured on Simply Crochet Magazine's social media in August 2015. Thistlebear was highlighted as a "best current blog" in Let's Knit Magazine's April 2016 issue. What does it mean to be a "part-time homeschooler"? I'm so glad you asked. Sometimes I'm not exactly sure either. Basically, it means that we have a unique opportunity to provide half our children's schooling at home, through a public alternative school in our city's school system. The program combines 50% traditional classroom learning with 50% homeschool time, which equates to four half-days in the classroom and an approximately equal amount of time learning at home. There are joys and difficulties associated with this situation, but it's mostly really good. Thistlebear is a name we came up with as a joint title for ourselves years ago. My husband calls me "Thistle" as a nickname and always has; the word is engraved inside my wedding band. His family nickname since childhood is "Bear" and we gave our children ursine nicknames to go along with it. I use these names on my blog (often abbreviating the children as LB and GB) for privacy. I'm Thistle and they're the Bears. I mostly use a Nikon D40 with various Nikkor lenses. I use the 18-55mm and 35mm lenses most often. I'd say the 35mm is my favorite lens right now. Sometimes I also use a Nikon D300, but I'm not as experienced with it. I'm very much a novice photographer, largely self-taught with help from the Bear, who is quite accomplished. I've been asked for photography advice, which is flattering, but all I can really say is: practice, practice, practice. You'll develop your own style and perspective the more you do it. edited to add: Since June 2015, I've been using a new camera, a Nikon D7000. After nearly eight years, the D40 was laid to rest. I loved that camera and during my time with it, I learned almost everything I know about digital photography. I'm adjusting to my new camera and I'm happy to say it's a very good one. What kind of yarn do you like to use? What are your favorite crochet hooks? I mostly use acrylic yarns, and I tend to prefer worsted-weight and double-knit (or baby, or sport) weight for most projects. For worsted-weight, I use a lot of I Love This Yarn from Hobby Lobby; it's sturdy and strong for family use in blankets and the color range is excellent. For lighter-weight yarns, I love Stylecraft Special DK (a British product imported from Turkey; I order mine online from Deramores.com and Woolwarehouse.co.uk), as well as Baby Bee Sweet Delight baby yarn from Hobby Lobby. As of fall 2014, I've been using Clover Amour crochet hooks with rubber grips on the handles. I find them really comfortable to use. From all over! I love the selection and sale prices at Fabric.com and order from them fairly often. I've purchased fabrics from Etsy sellers as well; this can be a great resource for special finds, like Japanese imports and pre-cut formats such as jelly rolls and charm packs. I also buy fabrics at Jo-Ann, Hancock and Hobby Lobby. My stash isn't huge but I love having plenty of fabric to choose from. Would you like to review my product/collaborate with me/share a sponsored post? I'm open to discussing any of these topics; please email me (see above for my email address). I've noticed that you share recipes that contain fat/salt/sugar; these aren't part of my diet, can you recommend substitutions? Usually, no. I find great joy in cooking as well as eating, and I think every ingredient has its place in the kitchen. For me and my family, good eating means a mostly-healthy diet that includes fat, salt and sugar in moderation. Isn't it always hot and dry in the desert? Where did that snow in your photos come from? Albuquerque is located in the high desert, which is relatively cool and wet. We live in a part of the city that is near the base of the Sandia foothills; our elevation at home is about 5500 feet. We get some snow in the winter and often get a lot of rain in the summer monsoon season. Summers are fairly hot and winters can be quite cold, but in general, the climate here is mild. As deserts go, it's a pretty pleasant one. what a lovely find, this blog! p.s. Thought you might like to know I've added you to my favourite blogs list on my blog. Thanks, Isabelle, that was really nice of you. The half homeschooling, half school is really neat - I wish we had something like that here, it sounds like the best of both worlds. I'm loving the new camera! Hi Carlin, I'm sorry not to have seen your comment sooner. Thank you! Our school program is unique and very interesting. It's a good compromise for us. I just "found" your blog, and I love it! I can't wait to go back and start reading from the beginning. Your family is adorable, and your projects are beautiful. God bless!